Don’t these make you want to find some fun kind of material and make your own? They did for me. Come back tomorrow to see what I bought to make my mirror. Many thanks to Amanda for sharing her great leather project with us while I was on vacation! I’m back renewed, refreshed and ready to tackle my next project. 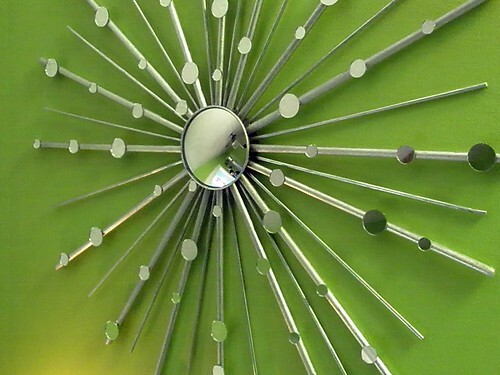 This week I’m going to make a starburst mirror using reclaimed materials. I’ll take you shopping with me and show you how you can support a local nonprofit, then I’ll figure out how to put my materials together to make a starburst mirror. At the moment I have no idea where I’ll hang it. Maybe you can help! Remember Dara from Li Sashay? She has a new Kickstarter project to promote her custom clothing and jewelry designs. Check out her project page and consider making a donation to help this local designer realize her dreams. Many thanks to Dara for helping me with my roman shades! She’s a talented lady. Here’s the almost finished project! While working on finishing up, I managed to spill a bunch of my dye (beware doing this! You can use nail polish remover to get it up, but this will damage many surfaces). I had to order more dye, so I’ll send Amber more pictures of the bag when it is totally complete. The finished project has a bit of a shine to it, which I really love. If shiny is not your thing, Angelus makes a paint duller that will make the bag more matte. I learned a bunch of things doing this project! 1. Dramatic shifts in color should be done with non penetrating dye. 2. Acetone (nail polish remover) can be used to fix some mistakes, but may damage your bag. 3. Your base bag color and dye color should complement each other. 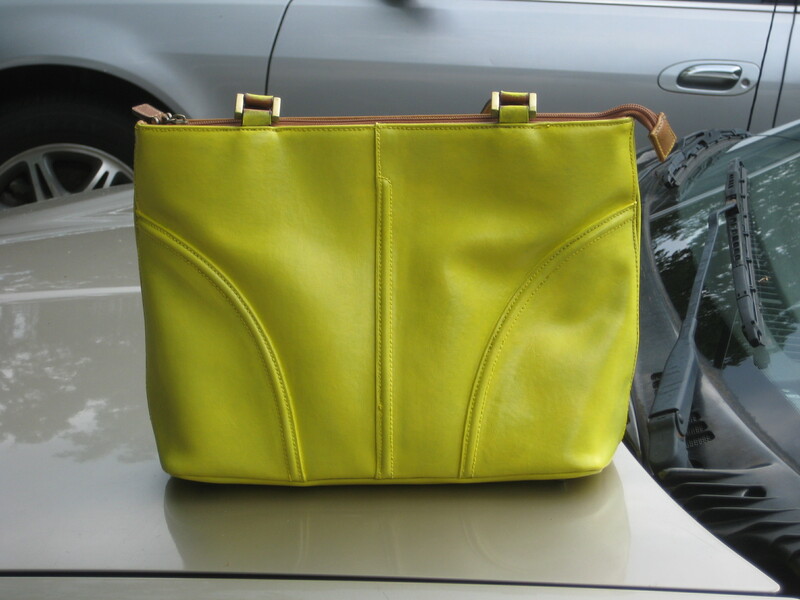 It is hard to find a bag where no element of the original color will be somewhat visible. You can’t dye zippers; if they are visible on your bag you need to pick a complementary dye color. 4. Simpler bags with less stitching will look best after being dyed. 5. This project can get expensive! Between the dye kit(s?) and the bag, you might spend as much it would cost to get a new purse in the color you like. 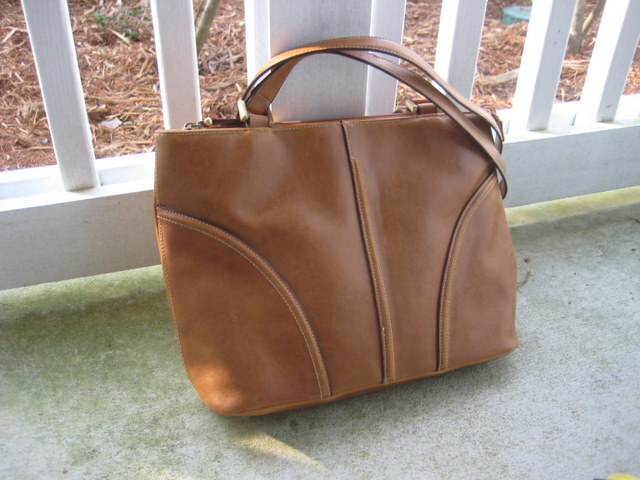 It is best if you can start with a old bag you own but don’t like or a very cheap thrift store find. 6. 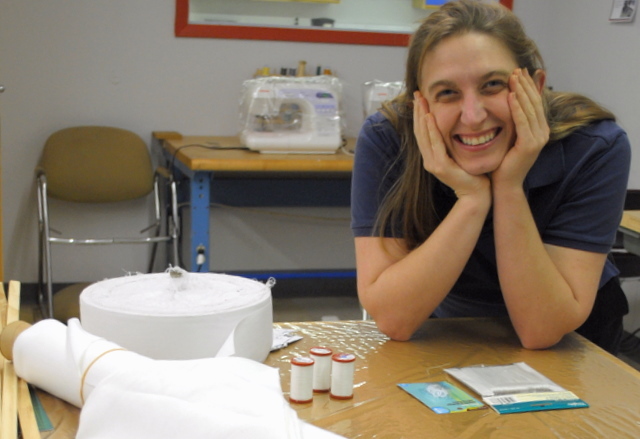 Every purse is a possibility, and dyeing can be just a starting point. You can add all sorts of details and stitching to you new bag. Also, think beyond bag, since you can dye shoes too. This is a great way to recycle bags or shoes you would have otherwise thrown out. The possibilities are endless! 7. Writing up craft blog posts is much harder than I’d have imagined. Major props to Amber for doing this for 20 weeks now! Dyeing the purse was incredibly easy. The Tarrago kit I got included a preparer, the paint to dye the purse, and a sponge and brush to apply the paint. The first thing I did was apply the preparer with a soft rag. This conditions and cleans the surface to get it ready for the dye. The instructions for preparer use vary depending on the material of the bag; for my faux leather purse, I just needed to clean the purse with it, but for some materials you need to make sure you remove a finish on the outside of the bag. 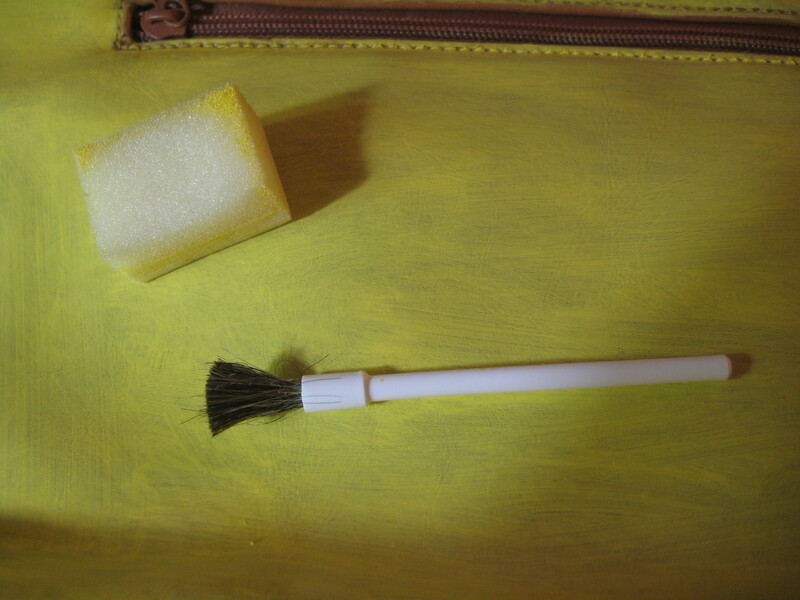 After this, I used both the brush and sponge to apply layers of paint to the purse. The brush was good at getting paint into crevasses, while the sponge applied a thin, even coat over the bag. I repeated this process several time (I lost count) until I had nice even cover of the dye over the purse. Since my bag was transitioning from a darker color to a light color, I had to use a fair amount of dye (2 kits worth). It took several days to achieve the coverage I wanted! Come back tomorrow to see the finished project! Given my busy schedule, I turned to Ebay to find a purse to dye rather than hunting one down at Goodwill or a vintage store. I really had no idea what shape or color I was looking for when I started hunting, so I started by looking at bags under $10, hoping to get an idea. After looking at a bunch of options, I decided I wanted something that looked like a smaller tote bag and that I wanted to make it bright yellow. When I saw this faux leather bag, I knew it was the right one for me! There are several dye options available. Turns out that the leather dye Lucky featured was not real dye; the leather “dye” they use is really an acrylic paint that just covers the leather surface. Traditional penetrating dyes are available, but they are not capable doing dramatic changes. For example, you can’t dye a dark colored purse to a light color. For my purse, I wanted to make a more dramatic shift (medium brown bright yellow), so I decided to use an acrylic paint “dye.” I decided to use this Tarrago leather dye kit from Manhattan Wardrobe Supplies in lemon yellow. 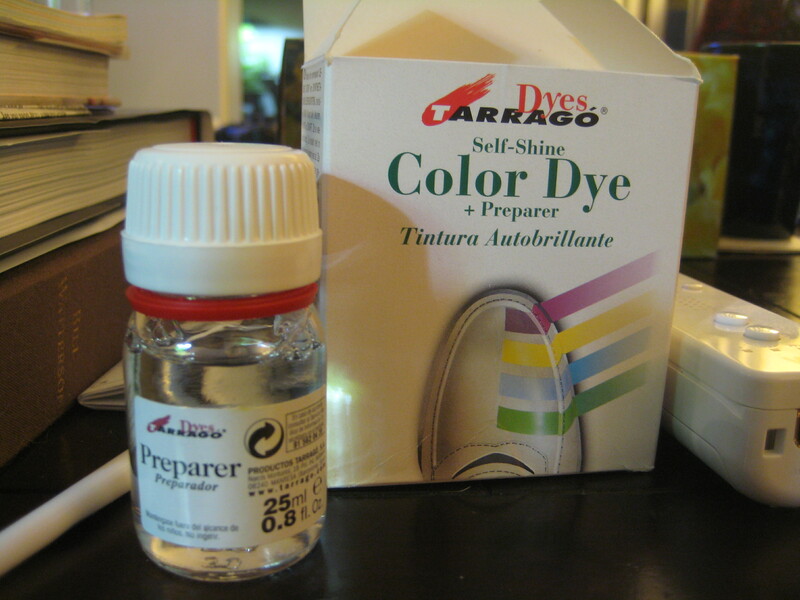 Tarrago is the dye featured in the Lucky article; however, there are several other brands of dye available. Search the Manhattan Wardrobe Supply site under shoe care to see several other options. other people who’d dyed purses. After studying their attempts I decided to give it a try myself! You are currently browsing the 50firstcrafts blog archives for May, 2011.